I feel like I've been on hold for much in the way of adventures since winter keeps me indoors, but I am making up for it now that Spring has arrived. It's like I've been let out of my cage to fly here and there to see what Creation is displaying at this wonderful time of year. Randal and I are not beach people, so we can count on one hand the number of times we've been to a beach, and they would all be during off-season. Since I got an email with a deal in Myrtle Beach for an efficiency with a kitchen at $38 a night, I couldn't resist a getaway in March to add a bit of warmth to my wintering joints. I scheduled every hour of the trip so we could make the most of it all and we truly enjoyed seeing new sights and new adventures for me to list on my 60 new adventures in my 60th year of life. I still have less than 5 months to gather up the rest of my adventures and realize that I will far exceed 60 this year. Focusing on new adventures really does keep you more alive for each day. Even through the dreary winter my mind was kept alive remembering my previous adventures and looking forward to whatever new adventures I would have. For me, you can keep new clothes, movies, DVDs, cable TV, and a long list of other things we eliminate to always have a travel budget .... I'd rather see more of what God created for our enjoyment in the natural world than most other things offered as entertainment or necessities. Especially when I can photograph it and visit it again and again and again. Experiences haven't always been more appealing to me than collecting stuff. When I was in my teens I was a typical teenager, but somewhere along the way I realized that memories of events/places/people were more special than stuff. With limited resources, you make choices in life on what's important, especially after you have your house furnished and children grown. We don't have grandchildren yet, but from what I've seen that will trump all else. #42 of 60 - Adult Sharp-shinned Hawk - One day at lunch my husband looked out the dining room window and said there's a hawk on the black willow tree, which is right in front of our porch. I knew right away it was different than the Cooper's Hawk we'd been seeing so I took a lot of photos and discovered it was an Adult Sharp-shinned Hawk. Technically, this isn't a new species for me, but the juvenile and adults look so different, I'm counting it as a new adventure. 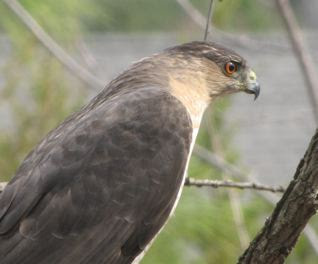 Four and a half years ago we had a juvenile Sharp-shinned Hawk on the corner of the roof at our deck. It was very exciting to see it from the kitchen window only 13 feet away. Well ... as happy as one can be with a hawk that stalks your feeder areas. So far I've been blessed with not seeing anything served for lunch. At least he's a considerate hawk. The Sharp-shinned Hawk is very similar to the Cooper's Hawk and since we've been getting numerous visits this year I've been given a lot of chances to practice my identification techniques ... although, my technique is to pull out my Sibley guide and Google for images. If that doesn't work I resort to an online bird forum for identification. #43 of 60 - Occoneechee State Park in Clarksville, Virginia, was only a mile off our route on a trip to South Carolina. This park is located along the peaceful shore of beautiful John H. Kerr Reservoir, more commonly known as Buggs Island Lake. 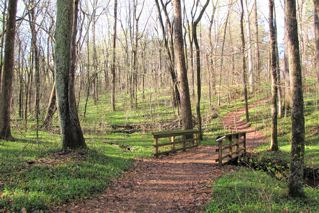 It has more than 18 miles of trails that meander through the forest and along the lake's shore. There are habitat enhancement plots for wildlife along the park's main road that attract birds, deer and woodland creatures. The 1.2 mile long Plantation Trail is what we took to read about the history of the land while strolling through the woodlands after a visit to the garden area that was behind the plantation home which is no longer there. The home burned down on Christmas Eve, so it only had rocks to show the outline of the foundation. Read more about Occoneechee State Park. View photo album of Occoneechee State Park. #44 of 60 - We initially planned a visit to the Centennial Campus Center for Wildlife Education in Raleigh, NC, because of the sustainable design of the building, but the Center’s indoor displays focus on wildlife and changing habitats in the North Carolina Piedmont, which was very educational. In the auditorium we viewed a 20-minute video with a timeline of changes in the Piedmont over the years, from a prospective of natural wildlife areas to suburban sprawl. It's a great place for family or group field trips with exhibits, video and outside demonstration areas. We especially liked the man-made wetland habitat that was created by the building. 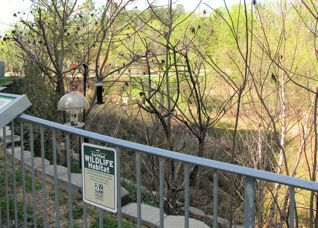 Some of its features are mentioned in the photo of things needed for the habitat. Admission was free so it was a nice quick stop on our trip to the Carolinas and was only three miles from our next stop at the aboretum. Read more information about the Wildlife Center. View the brief photo album of the Center. #45 of 60 - The JC Raulston Arboretum is filled with over 5,000 different kinds of plants collected from around the world and on display in ten acres of various beautiful garden settings. Many rare plants prosper here and some collections are considered among the most comprehensive in the world. I'm not that impressed with world collections since I have a love for native plants that provide food for native species, whether birds, bugs, reptiles, animals or whatever. Plants at the arboretum are evaluated for their landscape potential and superior plants are identified and promoted in cooperation with the nursery industry. This is the sad part, since nurseries should be studying more about the native plants that are self-sustaining. What could be better for landscaping than carefree plants? I could consider having had a bunch of new adventures from this place since I met so many new plant species I'd never seen, but because there were so many with little individual attention, it wasn't like seeing a new bird, bug or butterfly, even though plants do stay put to enjoy for much longer than something flying away. I guess it's a bit overwhelming when you see so many plants in one place. 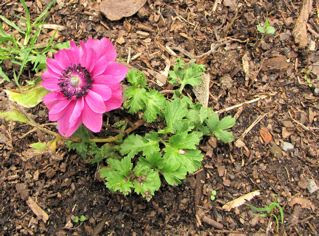 My favorite flower was the one shown here, Anemone Coronaria, which is a native of Israel. Read more about J.C. Raulston Arboretum. View photo album of the Arboretum.